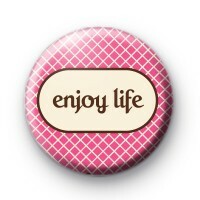 Enjoy Life Pink Button Badges. A pink check button badge with a brown and cream text which reads Enjoy Life. A Motivational badge to promote positive thinking. Standard 25mm badge handmade in the UK. We have a great range of motivational and positive button badges. Have a browse or a search to find more.